We debuted on the audio system market in 2016. Our offer included three prototypes of active speakers, which then became our guidepost for designing the current ones. Since the start, we aimed to combine audiophile sound quality with a stylish presentation and precise execution. By doing so we managed to achieve something absolutely unique – our columns provide not only extraordinary sound but also visual sensations. The Fram speaker columns will be appreciated both by professionals using our equipment for studio purposes and audiophile amateurs fascinated by the impeccable quality of the generated sound in the comfort of their own homes, irrespective of the music genre. The design – light and full of elegant simplicity can easily be adapted into any set up, while availability of three different models enables the selection of the most suitable equipment for given acoustic environment. 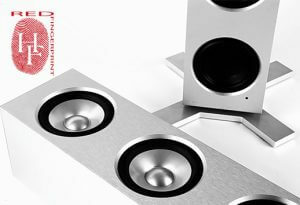 We designed the speaker columns with the thought of those for whom music should above all fill the air, giving sensations similar to those of the best concert halls or recording studios. The whole electronic layer was made in Poland with partnership with Ancient Audio, using their longtime experience in the field. The key differentiator of our sets is the perfect sound – natural, three-dimensional and detailed. We achieved that by using software dedicated to controlling the columns’ work. It includes not only the parameters of the speaker(its possibilities and restrictions), but also the qualities of the casing and the surroundings. The tuning of the columns was based on every fundamental music genre and conducted in various-sized rooms, using different types of sources. The information about the optimum working conditions is given in the descriptions. Just like we intended, the sets don’t aim to substitute, merge or duplicate functionality. We never wanted them to function as the main control device – they don’t have the sound source. However, with any given source they create a complete audio system. To enable that, every set includes RCA connecting cables and a jack-jack. While designing our sets we cared not only about their excellent sound, but also their appearance. That way, we managed to create a harmonious whole. The timelessness of our design is in its minimalistic form and the austerity of the material used, rarely seen in speaker sets. During the production process we used two types of aluminum, both of which underwent extremely precise tooling in CNC machines. Moreover, the columns’ surface was brushed and anodized, which besides the aesthetic appearance provides it also with durability and resistance to damage.